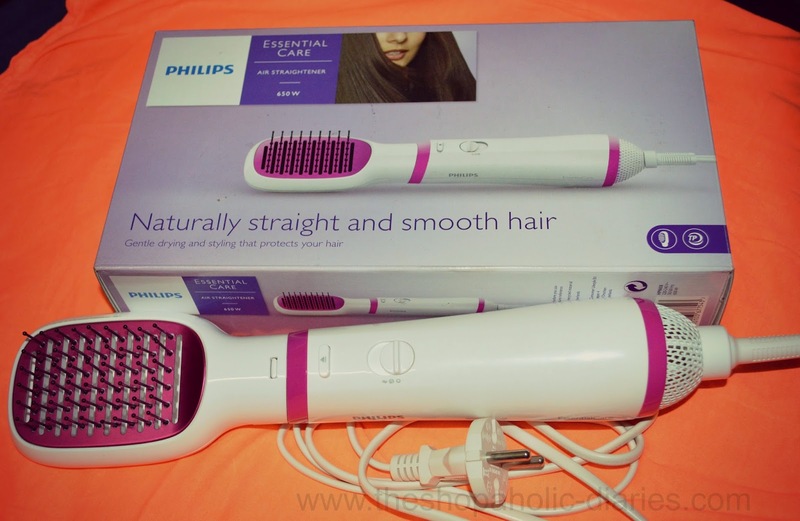 Review - Philips Essential Care Air Straightener | The Shopaholic Diaries - Indian Fashion, Shopping and Lifestyle Blog ! Today I am going to write a review for the latest styling tool in the market - Air Straightener - a part of the PHILIPS' Essential Care range. This styler priced at Rs 1695 claims to gently dry and straighten your hair while protecting them. I have naturally wavy hair which act as per their mood. I know it sounds funny but my hair sometimes look and feel really smooth after wash and sometimes get very frizzy. So, while I have thought about getting them rebonded or smoothened, the after-effects of using chemicals scare me a lot. 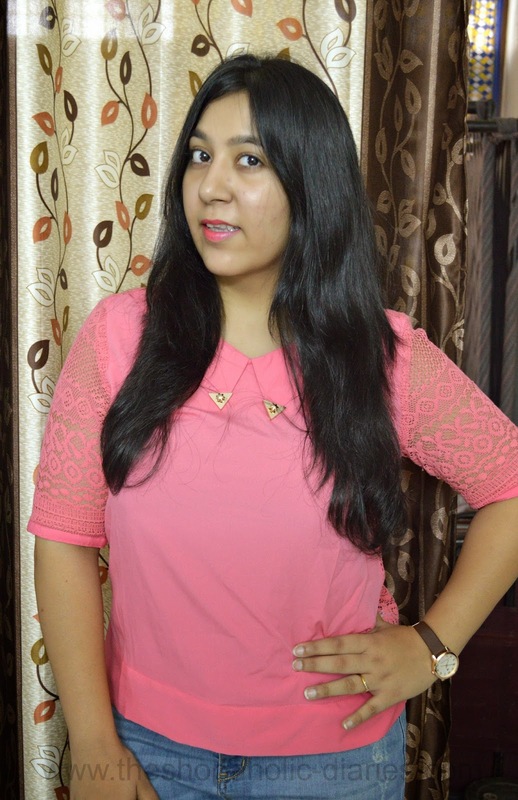 I have tried many styling products before but it involves a lot of time to straighten the hair without causing them any damage. Therefore, when I was contacted to review this styling product, I was more than eager to try and see if it works well. Dry & style at once - the new Philips Essential Care air straightener allows you to achieve naturally straight hair, while providing care to your hair with the ThermoProtect temperature. With the innovative Paddle Straightening Brush, attached to the handle, you can create beautiful naturally straight looking hair, without damage. The styler has an easy-to-use shape which has a good grip and hold. The bristles are wide enough to go through the hair smoothly while combing them. I used the styler for around 10 minutes to straighten my towel-dried hair and the results were really good. I used the styler only for 10 minutes as I was in a hurry, but I am sure it can straighten the hair really well if used for 15-20 minutes at the higher temperature. The styler also made my hair soft to touch which is difficult to achieve when you use a regular iron or straightener on your hair. 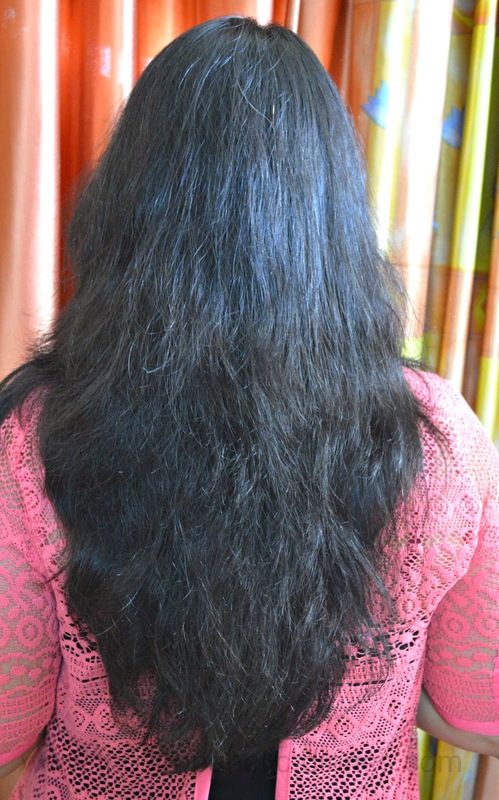 My Verdict - The Air Straightener is a great buy at a reasonable price, if you want to achieve a naturally straight look without overheating or damaging your hair. Have you tried this Styling product by PHILIPS yet? They are coming up with some amazing products lately which not look promising but also are decently priced. now i want this !!!!!!!! Yeah !! The priduct sounds good. Your hair looks stunning N! This product looks absolutely amazing. Your hair looks nicely styled. Have never tried Philips products though. Seem interesting. Ok so you have convinced me to get this. I have been hearing a lot about this but was somehow in 2 minds about buying this. Awesome review girl!